It feels like just yesterday when we bid a fond farewell to our Airstream that we loved, polished, painted and toiled over for a mere two days' worth of camping fun. And while it may have taken me some time to warm up to her, it was sad to watch the new owners drive away with our first family project. Our original plan was to take that money, combined with the proceeds from the sale of Joel's truck, to pay off some bills and renovate our bathroom. We took some glamour shots of the Navigator and uploaded them to Craigslist, picked out some nice tile and a new shower for the bathroom, and discussed the potential of saving up for a newer and better Airstream next summer or fall. So where did I go wrong? I think my first mistake was in believing that my husband could actually hold out for an entire year before purchasing another home-away-from-home that he could buff and I could roll my eyes at in disbelief. My second mistake was in assuming that our Navigator would sell, which it hasn't, and lastly I was premature in selecting a beautiful neutral tile and flashy blue glass accent tile for the bathroom. Who was I kidding? Without my nasty bathroom, what else do I have to discuss? Perhaps I could chat at you about what I thought when I saw this in my driveway. 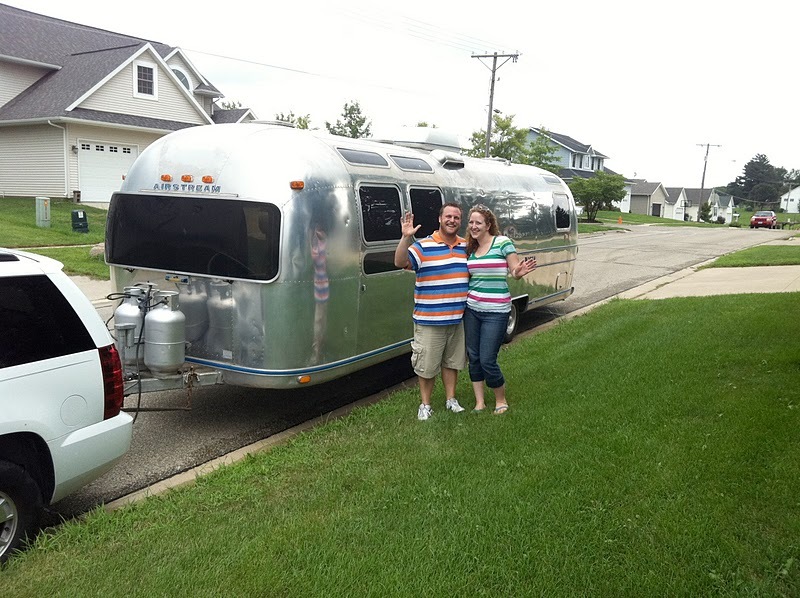 Meet our new baby Airstream motor home. Despite the fact that our financial plans were a bigger disaster than Graham's diaper after eating too many raisins, Joel bought himself a ticket to West Virginia to buy our new dependent. The previous owners stocked it with fresh sheets and towels (and a few of the town's signature pepperoni rolls... mmm) and Joel steered it on home. Many miles later, we received word that Daddy was home and we hurried over to check out our new camper/vehicle/motel. In a word, it's purple. Purple carpet, purple curtains, purple pillows. Upon entering it the first time, I could envision myself as an 80 year-old lady knitting a purple sweater on the sofa (at 80 I would call it the davenport) with my many cats and themed sweaters. I'd take my teeth out and place them in a purple cup on the countertop while I nap in my purple bed. I'd remove my purple orthopedic slippers and fall asleep to the hum of the Airstream motor. Nice vision. But in the present, I'm still 28 and I don't knit. And I'm not a fan of purple, at least not on my ridiculously gigantic motor homes. Cael and Graham were delighted with the new member of the family. They both got up on the beds and promptly took off their shoes and socks, which I have chosen to interpret as their unofficial seal of approval. Cael, still hopped up on oral Prednisone, had to be peeled off of the driver's seat where he was pushing buttons and turning knobs at random as if he were at the helm of his own steam engine. I can't blame him really-- the driving area really is impressive both in size and in vintage 1980's appeal. After some careful consideration, I've decided that the only thing to do is embrace it. The RV needs a serious makeover, and very little of what needs to be done can be accomplished in a weekend or with little financial effort. But that's okay. Who needs a bacteria-free shower anyway? I think if you call the color MAUVE you would be better at impersonating an 80 year old grandmother type!! Excellant post. 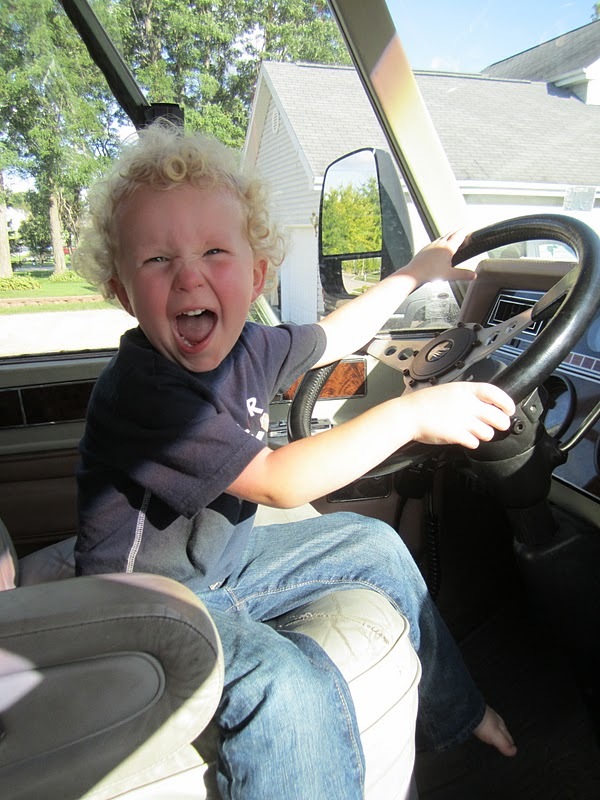 I can almost invision you driving the streets of Port Orchard on the way to Bampa's house!! Happy Camping! You're exactly right! And in the photos, they look less purpley and more mauve than they do in real life... it's a "have to see it to believe it" scenario! Shawna- that's my current plan, more or less. I'm also hoping to switch out the knobs on the cabinets but there are about a million, so that may have to happen in stages!